﻿The seminars by a global scholar of Old Testament , Dr. Bruce Waltke, in Korea are drawing much attention from pastors and theologians in Korea. That is because they are given the opportunity to attend his lectures on 'The Redemption in Psalms', which they could only read from his books until this time. As soon as he arrived Korea yesterday (7th) for the first time, he headed to the summer camp of Pyungkang Cheil church in Yeoju and began his lectures in today's (8th) morning. In the morning lecture titled "Why Have You Forsaken Me? ", he explicated the chapter 22 of Psalms for two hours from 9 to 11. He noted that chapter 22 of Psalms has to be read with redemptive perspective of the Old Testament as well as with perspective of the New Testament in which Jesus Christ achieves. He further pointed out that the situations of Jesus Christ in the time of sufferings can be applied to those of current generation, and they could earn consolation and the strength to fight against hardships and dismal situations. 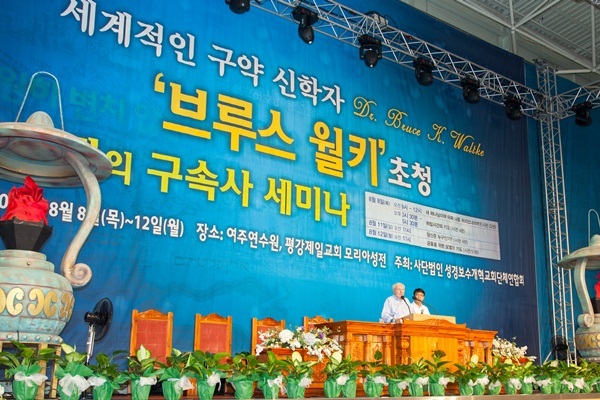 In the course of lecturing, Dr. Waltke confessed that he was surprised by the spiritual intelligence of members of PyungKang Cheil church and by the improvement of Korean churches. He thanked Reverend Abraham Park for giving him an opportunity to visit Korea and for inspiring him with his book series called ﻿The history of Redemption ﻿Series﻿. In the midst of scorching weather, about five thousand of pastors and member of the Church attended Dr.Waltke's seminars and expressed much interest in them. His seminars are to be continued on both this coming 11th and 12th at Pyungkang Cheil church in Seoul.